I live in the heart of Costa Rica’s most populated region, the Central Valley. In fact, I live in the Gran Area Metropolitana (GAM), the name given to the capital, San Jose, and surrounding suburbs. The Valley has about 70% of the country’s population. It’s a center of culture and commerce. And the GAM, which contains towns popular with expats like Escazu, Santana, and Heredia, is honestly a sprawling urban area with traffic and noise. I, like many foreigners here, chose this area for the conveniences. There’s great shopping—if you can find it in Costa Rica, it’s here, and there are plenty of imported items in the grocery stores. The country’s best hospitals and most specialists are right down the road. I enjoy seeing new releases (in English) at one of several multiplex theaters ($5 a ticket, by the way). And I’ve come to enjoy world-class classical music performances downtown in the National Theater—just $4 on Tuesdays ($2 for those over 65). Now, this may not sound like the Costa Rica most people dream of. I’m in the big city, after all, not on the beach or in the jungle. But here’s the thing…I can be on a Pacific coast beach within about an hour on a modern highway. And almost everywhere else in the country (like the mountains, rain forest, or Lake Arenal) is within five hours at most (less than an hour by small plane). So I get to enjoy the best of both worlds when it comes to Costa Rica. My home base is in the heart of all the action, but I can easily explore all its natural beauty whenever I want. One of my favorite day trips out of San Jose is Braulio Carillo National Park. Head north out of the city, for about an hour, on Highway 32 into the mountains that surround the city and you’re soon enveloped by lush cloud forest. It’s a type of high-altitude rain forest that is almost always dripping with moisture thanks to the clouds that pass through the trees. Sections of the park are over 9,000 feet. This unique environment is home to several species seen only in a few other locations, including the resplendent quetzal (bird watchers travel to Costa Rica just to see this one). There are about 500 other species of birds here, along with more than 130 mammals. 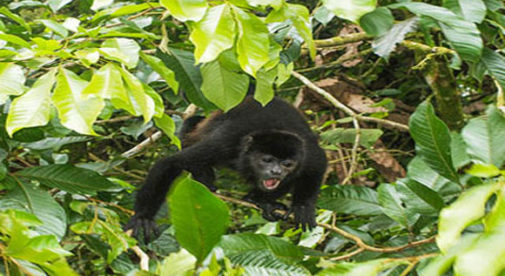 On one recent hike, we spotted a howler monkey eating some sort of fruit in a tree. They’re fairly small, but the sound they make is unearthly and tremendously loud. A little frightening if you don’t know what to expect. Braulio Carillo, accessed by two ranger stations off the road, is little visited. Most tourists head to parks on the Pacific or Caribbean coasts. So even on weekends we usually have the place to ourselves. The trails wind their way through the hardwoods, giant ferns, bromeliads, and epiphytes (“air plants” that cling to trees) that make up the cloud forest. You can feel a real connection with nature…just a short drive from the big city.